20% OFF + Extra $15 LOFT Coupon - Verified 39 mins ago! Loft is one of the leading women’s specialty retail fashion brands in North America. Owned by its parent company ANN INC., LOFT Stores can be found in 47 states across the United States, the District of Colombia, Puerto Rico and Canada as of 2014. LOFT brands are also found in more than 100 countries worldwide via their website LOFT.com. You can now use a LOFT coupon seen below to own you savings with Coupofy. 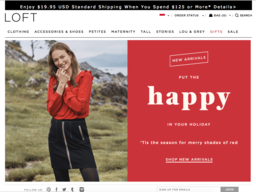 Loft's parent company was founded in 1954 by Richard Liebskind and has since become a powerhouse for women’s clothing, operating more than 1,000 stores between its brands; Ann Taylor, LOFT, Ann Taylor Factory, and LOFT outlet stores. Details: Get an Extra 15% Off Discount On The First Tuesday Of Every Month When You Open a LOVELOFT Card. Buy Online And Pick Up In-store! Details: New Customers Only! Get $25 Off $100+ Purchase with LOFT Email Sign Up. Coupon sent via email, may take up 48 hours. Valid on full-price items. Scroll to bottom of page and click 'sign up for emails'; your discount will arrive in 24-48 hours to your inbox; please be sure to check Spam folders. LOFT was specifically developed to bring a feminine appeal with affordable prices to real women. The company focuses on unexpected details, flattering fits and versatile, accessible fashion. Connecting with women on a genuine level and bringing the latest fashion to women all over the world. The company's official online shop is located at loft.com. If you'd rather visit one of their locations in person, especially if you're trying to use a Loft printable coupon, then you can use the store locator to find the nearest one. They love when their customers showcase themselves wearing their merchandise. If you upload any photos to Instagram, then make sure that you tag it with #loveloft. You could end up featured on their website gallery. The company is also active on other social media networks including Facebook, Pinterest, Twitter, and Tumblr. Clothing (T-shirts & Blouses, Jackets, Tops, Dresses & Skirts, Jeans & Pants, and Shorts), Shoes (Flat Shoes & Sneakers, High Heels, Sandals, Wedges, and more), Accessories (Jewelry of all kinds, Sunglasses, Scarves, Belts, and Hats), Maternity clothing, and Swimwear. Before you buy something on the website, make sure that you check out the size guide available on the website. 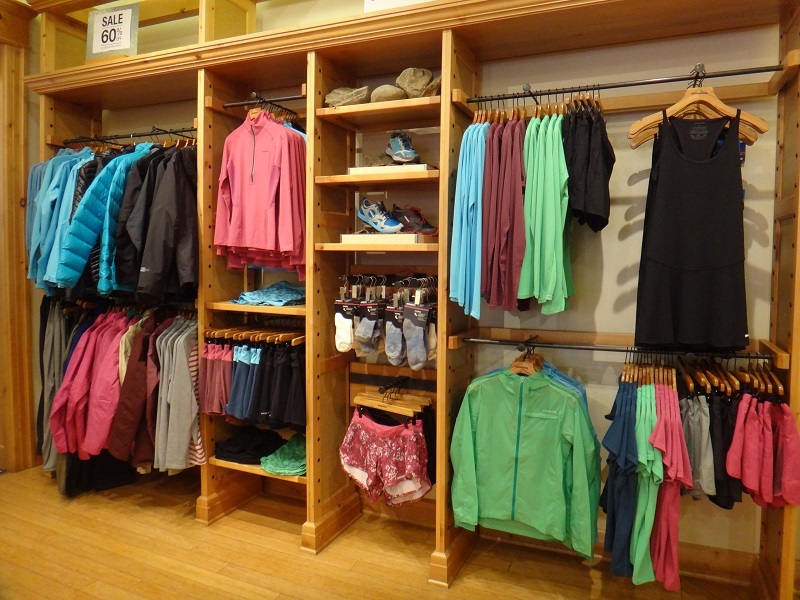 You'll want to get the right size apparel to ensure that you don't have to return anything. It can sometimes be a bit difficult picking out something appropriate for someone else. The perfect solution is to get them a gift card so that they can pick out exactly what they want for themselves. The company accepts a variety of payment options. Forms of payment include Visa, MasterCard, Discover, American Express, Diners Club, JCB, Visa and MasterCard for debit cards, and LOFT gift certificates. LOFT does not currently accept PayPal or Bill Me Later options nor do they accept any form of payment with a non-United States or Puerto Rico billing address. Another option when it comes to payment is to sign up for a Loft credit card. Upon signing up, you'll automatically be entered into their rewards program. This entitles you to immediately save 15% off of your order without having to use Loft coupon codes or anything. Every 2,000 points you accumulate will earn you a $20 rewards card. Reward members will also receive an extra 10% off the first Tuesday of the month as well as a special birthday gift. Always be on the lookout for Loft outlet coupons also. Do you have a special promo code to redeem? Then fortunately the process is very simple. Just shop on the website and make your way to the checkout page to get ready to pay. In order to reduce your order total, just enter your Loft coupon code in the appropriate box on the checkout page. LOFT ships orders to all locations within the United States and Puerto Rico and internationally to Canada, United Kingdom, Mexico, Central America, the Caribbean, South America, Europe, Asia-Pacific Countries, South Asia, Africa, Middle East, Iceland and the Russian Federation. Estimated delivery is 4 to 17 business days depending on the shipping destination and is calculated by a number of factors such as, the desired shipping speed, number of items purchased, weight of the items, and the destination country. The international shipping prices are calculated and guaranteed during the Borderfree global checkout process. For domestic shipping, customers can choose from Standard Shipping, 3-day Business Shipping, and Next Day Business Shipping. The company offers free shipping for orders over $125.00 USD and to be eligible, the qualifying amount must be met after a discount or promotion is applied. LOFT accepts returns and exchanges for unworn, unwashed and defective merchandise by mail and unwashed, unworn, defective merchandise may also be returned physically to any of their retail store locations. The company does not accept returns on swimwear or maternity items at this time. There is a credit in the form of an E-Gift Certificate for the amount paid by the sender for returns that are accompanied by an original receipt, received within 45 days of the date of purchase in original form. If a customer does not have the original receipt, he or she will be credited for the item’s current selling price on the date of return in the form of Merchandise Credit. LOFT does not accept the return or exchange of any Final Sale items, which is easily noted by the price ending in .44 or .88. Conditions may apply if you have used a Loft coupon code prior to purchasing and you choose to return your items. If casual and contemporary style is more of your preference, LOFT may be just the store that you’ve been searching for in your fashion needs. Understanding that quality casual clothing can often be pricey, LOFT provides women with a wide range of options at very reasonable prices. These reasonable prices are only further complemented by the use of LOFT coupons, which help to make shopping at this store even more affordable. One reason why LOFT has become so popular over the years is because it has catered to the variety of sizes and body shapes that women have. LOFT understands that many stores make it difficult for women to find the clothing they want in the styles that they need, solely based upon sizing differences. If you wear any sort of special sizing such as petite or tall, for example, it can become more challenging to find clothing in your size. However, LOFT is dedicated to providing clothing for all women, and as a result, carries many of the sizes that are uncommon by other store standards. LOFT also offers a full maternity line, which is great if you are transitioning into motherhood. If you’ve never shopped at LOFT before, you may be wondering if its truly worth it in terms of discounts. Rumours of options such as the LOFT teacher discount or a LOFT free shipping code may have made you interested in shopping at this respected online retail store. In actuality, LOFT offers quite a few discounts which can be redeemed throughout the year. To get greater insight into these LOFT deals, Coupofy has examined this store in depth to determine the best ways that you can achieve savings during any shopping experience. These days, paying full price for anything is generally unnecessary, especially when you are shopping online. This is only further demonstrated by LOFT’s generous discounts that are provided throughout the year using various LOFT promo code offers. Those who are new to shopping at LOFT may not know where to get access to the latest deals and coupons that have become available, so here are a few tips to help you get started. If you are interested in shopping at LOFT on a regular basis, you may want to consider signing up for the store’s email list. The email list will keep you updated when promotions, sales, and LOFT deals become available. During your initial LOFT email sign up, you will be provided with a $25 off of $100 coupon which can be used towards your first purchase. Afterward, you will receive regular emails that will let you know what you can expect and will help you plan for savings during your next shopping spree. Do you like social media? If so, you may want to follow LOFT on the social media platform of your choice. You can find LOFT on Pinterest, Facebook, Twitter, Tumblr and Instagram. Following on social media is a great way to receive real-time updates about anything that’s going on with LOFT. From time to time, you may find that you can even receive an exclusive LOFT promo code if you pay attention to the company’s social media posts. This is another good way to put you in touch with a coupon LOFT may not have shared via email yet. Of course, LOFT also has its own store locations. These store locations provide you with different coupons than what you might normally find. Although you can receive coupons by signing up for the email list, some stores utilize their own unique coupons which are not always provided via email. If you prefer to shop in-store from time to time, you might find that there are different sales and discounts compared to what you’ve been experiencing online. LOFT outlet coupons, for example, would be completely different from what you would find online because these coupons are more tailored towards the already discounted prices available at outlet locations. Sometimes you will receive printable LOFT coupons in store 2016 email offers, but they may not be as frequent as the discounts you’ll receive just visiting your local store. If you’re a teacher, you can receive a discount of 15% every time you shop at LOFT. To redeem this type of discount, you have to let LOFT know that you are a teacher and sign up for the corresponding discount program. You can sign up on LOFT’s website or also in store. When you sign up, you will be provided with a number of benefits and discounts that are exclusive only to teachers, meaning that these are not the same discounts that you would receive just being on LOFT’s general email list. These discounts are significantly higher compared to the regular discounts that are available, so it’s worth it to sign up for if you’re involved with education. LOFT is one of the few stores that provides exclusive discounts to teachers. When you’re ready to shop, redeeming your LOFT promo code is easy. Put the items that you want to purchase into your shopping cart on the site and then start checking out. You will be taken to the checkout page that will ask you for information about where you want to ship your items and how the items are going to be paid for. Usually, you will notice that there’s a box or a field where you can input your LOFT discount code. Input the code and click apply to receive your discount. If the discount has worked, you will see that the discount is applied to your final total. The discount will be immediate. If you don’t see any change or there’s an error message, you might need to check your LOFT discount code to ensure that you have input the information correctly. Try retyping it and then submitting it again. If it still doesn’t work, you may need to use a different LOFT promo code to ensure that you can receive your discount. Keep in mind that if you’re doing a promotion where you’re able to take off an extra 15% or similar, this type of discount may be automatically applied to your total. You should see this indicated in your shopping cart in most cases. Trying to redeem additional discounts with those types of automatic discounts may have some impact on whether or not you can redeem your coupon code. Why Didn’t My LOFT Discount Code Work? Sometimes when you are shopping online, you may have problems with redeeming your discount codes. This tends to happen when the coupon that you are using has expired. If you’re using a random coupon that you found online or an old promo code LOFT has sent via email, the coupon has likely expired. The best way to avoid expiration issues is to only use the most recent LOFT coupons 2016 that have been sent to you via email or social media. Your LOFT promo code might not work because you haven’t met the terms required for that coupon. All coupons have their own specific terms and conditions. Sometimes these are very specific and must be met in a specific way so that the discount can be provided. You might need to have a certain amount of items in your cart or you might need to have specific items in your cart in a combination with other items. Reading the terms before you attempt to redeem the coupon can provide you with more insight into what you need to do to get the discount. The next consideration is that perhaps you are using a coupon that cannot be combined with other promotions. LOFT has discounts which can be used with any promotion or offer that is currently available, but there are also discounts that are not eligible to be combined. If your discount is not working, you may want to check to see if you’re using a coupon that can be combined with the most recent promotion. A lot of times, when your coupon code won’t work, an error message will be displayed that may explain why it is not working. If no message is displayed and your coupon isn’t working, but you believe it isn’t for any of the reasons mentioned above, you may want to contact customer service to ensure that there isn’t an actual glitch or issue with your code. More often than not, they can provide you with some insight and another coupon code that will allow you to redeem the discount that you want. Depending on your financial situation, LOFT’s credit card may be another way that you can start redeeming savings. The LoveLoft card provides an impressive amount of benefits and should definitely be considered if you like to shop frequently. When you first open your LoveLoft card account, you’ll receive an extra 15% off of your purchase. Afterward, you’ll be provided with a $20 reward for every 2,000 points that you earn or every $400 spent while shopping online and in LOFT stores. However, the rewards don’t stop there. During your birthday, you’ll receive a $15 birthday gift from LOFT. All cardmembers have the opportunity to double their rewards points when shopping at private cardmember events that will be provided to you via email. On the first Tuesday of every month, you can also redeem an extra 15% off of your purchase. This extra discount can be combined with any promotions and offers that are currently available at the time, which really allows you to maximize your savings to the fullest. Although LOFT has two LoveLoft cards respectively, known as The LoveLoft MasterCard and The LoveLoft card, they both provide the same great benefits. The only difference is that with The LoveLoft MasterCard, you can earn additional points because you can use a MasterCard anywhere it is accepted. Both cards will provide you with 5 points per dollar spent when shopping at LOFT stores and online. The LoveLoft MasterCard will provide you with additional points in certain situations. For example, you’ll receive an additional point for every dollar that you spend at locations where MasterCard is accepted. For any gas and grocery purchases, you’ll also receive 2 points per dollar. Of course, it’s important to understand that the LoveLoft card may not be the best choice for everyone. Since it is a credit card, you have to consider your own financial responsibilities and capabilities before committing to using credit. However, if you are able to spend responsibly and pay off your purchases on a regular basis, the LoveLoft card may be an ideal way to help you achieve extra savings. Perhaps you know someone who loves LOFT or would love the clothing at LOFT, but you don’t know what to purchase for them as a gift. Shopping for clothing can be particularly difficult in regard to gifting because you might not always know the sizes that the other individual may wear or what their personal style is like. LOFT makes gifting easy by offering a number of gift card options that you can take advantage of the next time you would like to give someone a present. LOFT offers physical gift cards and eGift cards which can be given to the recipient so that they can make a purchase. The amount of money that you can put on these cards varies by amounts including $25, $50, $75, $100, $150, $200, $250, $500, and even $1000. Unlike many retail stores, LOFT gift cards don’t come with an expiration. This means that you can purchase gift cards ahead of time without worrying about giving them to the recipient in a specified period of time. It also means that if your recipient doesn’t open their email every day to discover the gift card or if they just don’t feel like shopping immediately, there’s no risk of losing the value on the card. This is particularly nice if you’re gifting cards with higher monetary values since it ensures that the gift amount will never be lost.